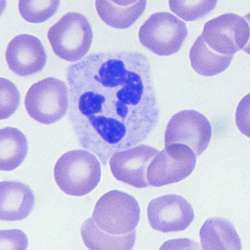 a neutrophil with a segmented nucleus. Granulation tissue consisting of adult fibroblasts, neovascularization, dense collagenous tissue and a moderate polymorphonuclear neutrophil infiltrate was observed at the aponeurotic lesion. Some polymorphonuclear neutrophils contain a small chromatin mass (1. With the aid of microscope, 200 polymorphonuclear neutrophils were examined for the presence of drumstick appendages. Activity of tissue MPO, an enzyme that is found predominantly in the azurophilic granules of polymorphonuclear leukocytes, correlates with the number of polymorphonuclear neutrophils determined histochemically in the inflamed tissues; it is therefore used as an indication of tissue neutrophil accumulation. Moreover, 80% of men with visible discharge had microscopic evidence of urethral inflammation (at least five polymorphonuclear neutrophils per high-power field over at least three fields on a urethral gram-stain).